At this time of year my thoughts turn to puddings, seasonal fruit and warming flavours. The classic French Tarte Tartin can be given any number of twists; change the fruit and the flavours and you can reinvent it time and time again. If you buy ready-made and rolled puff pastry (and let’s face it who has the time to make their own every time) it becomes one of those deceptive dishes, far far easier to make than those not in the know would think. All in all an excellent effort to glory ratio and perfect for any Fuss Free kitchen. It is pretty hard to mess this up. Firstly you do not need a special Tarte Tartin dish – I use a frying pan with a metal handle which can safely go in the oven. Please do not forget that the handle will get hot. I know it is obvious, but it really is very very easy to forget and to just grab the pan handle. I love cardamom, which botanically is a type of ginger (as is turmeric) and have a jar of cardamom sugar in the cupboard – simply fill an empty jam jar with white granulated sugar, add a handful of cardamom pods, shake and leave for a week or so. I top mine up as I use it. If you are not prepared crack a couple of cardamom pods and cook them in the caramel, fish them out before covering the tart with pastry. If the caramel splits do not worry – all will sort itself out when it is in the oven, (my caramel was a deeply unattractive curdled mess) once baking the juice from the fruit redissolves the sugar, and the pastry seems to absorb the butter. Ready made puff pastry really is rather good – choose one made with butter. When you pop the Tarte Tartin in the oven the pastry collapses, slumping over the fruit like a sheet of melted plastic, do not be alarmed if this happens, it will rise and puff. I lined my pan with a sheet of greaseproof paper – no stickage at all. 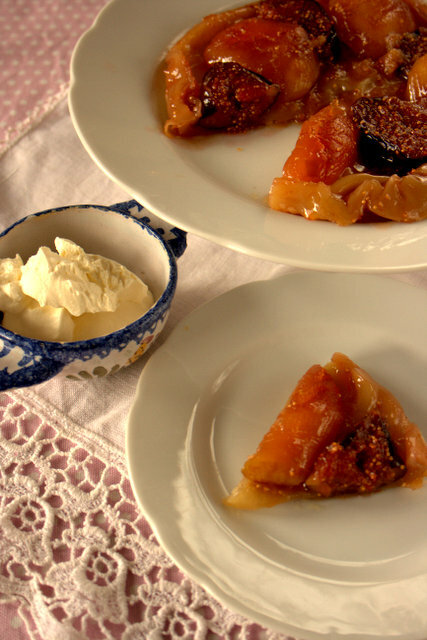 If you try this Recipe: Fig, Apple and Cardamom Tarte Tatin please tag #FussFreeFlavours on Instagram or Twitter. It is amazing for me when for me when you make one of my recipes and I really do love to see them. You can also share it on my Facebook page. Please pin this recipe to Pinterest too! Thanks for reading Fuss Free Flavours! Preheat the oven to 220C / 425F / GM7. Butter a 8? tarte tartin pan or oven proof frying pan well and place a circle of greaseproof paper in it. Add the butter and sugar to a pan and heat slowly on the hob until the butter is melted, continue to heat, stirring, until the sugar is melted and the mixture is golden brown with large bubbles – when it is ready the size of the bubbles will suddenly increase. This will take about 5 minutes. 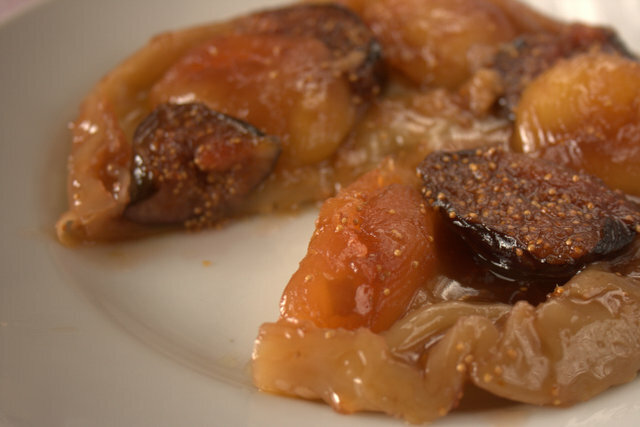 Place the figs (cut side down) and apples (core side up) into the pan and allow to cook for about 5 minutes. Keep a careful eye on it so the caramel does not burn. 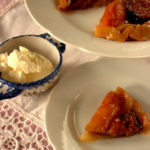 Arrange the fruit in the Tarte Tartin or oven proof frying pan and pour the reminder of the caramel over. Cut a circle of puff pastry slightly larger than the diameter of the pan. Place over the fruit and caramel mixture, tucking the edges in. Allow to cool for a few minutes, place a serving plate over the pan and flip. Shake and the Tarte Tartin should drop out. Remove the pan and peel the sheet of greaseproof paper away if needed.